Between K-cups, 100-calorie packs, and meal delivery boxes, it’s safe to say our culture has reached peak Single Serving saturation. Unfortunately, all that convenience results in mountains and mountains of plastic waste. 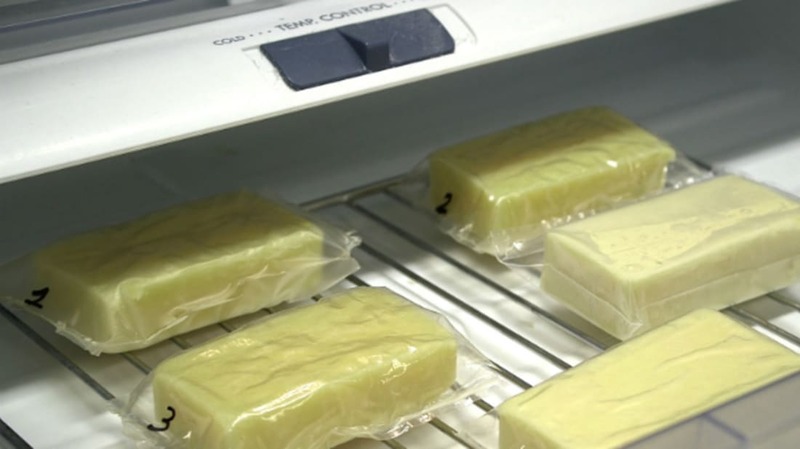 Researchers at the U.S. Department of Agriculture have come up with an intriguing alternative: edible packaging made of a milk protein called casein. They presented their invention in Philadelphia today at the 252nd National Meeting & Exposition of the American Chemical Society (ACS). Plastic packaging film is kind of a disaster. It’s made from petroleum, that most unsustainable of resources. It can’t be recycled, doesn’t break down in landfills, and leaches harmful chemicals into the environment and our bodies. And once it’s opened, it can’t do much to keep the food inside from spoiling. So yeah, an alternative would be good. Enter casein biofilm (not the catchiest name, but it’ll do for now). This thin wrapper is made of milk protein mixed with citrus pectin, which makes it tougher and more resistant to heat and humidity. It looks like plastic and handles like plastic, but it’s 500 times better at protecting its contents from spoilage-inducing oxygen, the researchers claim. Its ingredients are far more sustainable than dinosaur-made petroleum. And because it’s made of food, it can be eaten or composted, as you can see in this ACS video. "The coatings applications for this product are endless,” study co-leader Laetitia Bonnaillie said in a press statement. "We are currently testing applications such as single-serve, edible food wrappers. For instance, individually wrapped cheese sticks use a large proportion of plastic—we would like to fix that." But wait! There’s more! A lot of cereals are coated in additional sugar to keep them from getting soggy. A super-thin casein coating would serve the same purpose without hastening your next visit to the dentist. Other potential uses for the biofilm include lining pizza boxes to protect them from grease and providing the laminate on boxes and plastic pouches. Bonaillie and her colleagues say they expect to have the product on grocery store shelves in the next three years.